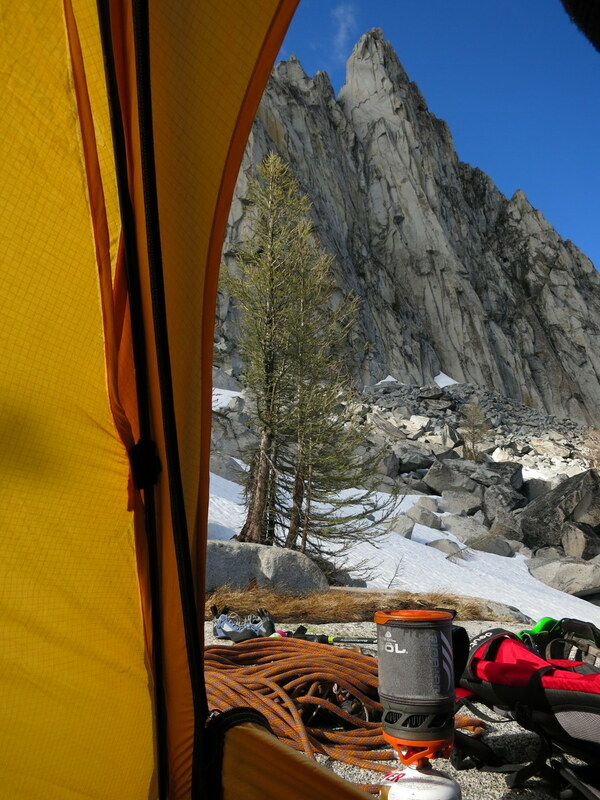 When the Jetboil Personal Cooking System first came onto the market in 2004, it was truly a “game changer” for climbers. The system (originally around 15oz before fuel) wasn’t any lighter than a small cannister stove and cookpot, but its genius was the integration of stove, lighter, burner, and 1liter cookpot that would al click together into a single unit. For climbers rapidly breaking out the stove on a snowy belay ledge, or squeezing it into a cramped Firstlight or portaledge, this simplicity and convenience more than made up for a slight weight penalty versus traditional canister stoves. The original Jetboil did have several nagging problems and was inferior to the soon-after-released MSR Reactor for winter trips when melting snow. But the new Jetboil Sol (and Sol Ti, which has a titanium cookpot) fixes all of the system’s old problems, and has emerged as another true game changer. The first and biggest difference between the original Jetboil and its newest iterations is the the weight savings. While the original system was 15-16oz, the new Jetboil Sol Ti is just over half that weight. The weight savings was produced by shrinking the cookpot from 1 liter to .8 liters, and by lightening every component from the cookpot’s lid to the stove and heat-exchanger fins. I still find the .8 liter capacity to be sufficient for the water required for a team’s hot drinks, water bottle filling, and preparing a freeze-dried meal, but the mere 20% reduction in boiling capacity does make the formerly top-heavy Jetboil feel much more stable in the slightly smaller size. If you bring the stove, cookpot-with-neoprene-cozy, lid, and bowl/measuring cup, the system weighs 9.8oz (the titanium model) or 11oz (the $30 cheaper aluminum cookpot model.) If you simply bring the stove and titanium cookpot, the weight is a scant 7.5oz, less than 1/4th the weight of a full Nalgene. A major problem with the first model was the fuel knob, which was small, hard to grip, and recessed underneath the cookpot. When the stove would inevitably boil over, 212-degree water coursed down over the knob, making it a painful exercise in self-inducing burning to turn off the stove. The Sol model features a much larger and easier-to-grab (even with gloves) wire tab, which thankfully projects out far enough from the stove to turn off an over-boiling system sans scalding. The original ignitor on my old Jetboil (and on those of several others I know) stopped working reliably after a year or two. A good friend actually grew so fed up with his gummed-up sparker that he manually removed it from his stove, since he would never trust it enough to leave the lighter at home anyhow. The included Piezo ignitor on the new model has been lightened and improved to be less-susceptible to destruction via grit, sand, and jostles in the pack. After a few months of use in the alpine, while car camping, and after throwing it haphazardly into my cluttered box of camp cookware, mine is still working perfectly but I do bring a backup Bic mini-lighter just in case. The Sol’s fuel/pressure regulation system has been improved as well, making the new Jetboil a better performer in the cold and near the end of your fuel canister’s supply than the original model. I still prefer an MSR Reactor if you are doing a multi-day winter trip where you’ll be bringing along multiple canisters and melting snow for all your water, as the heavier stove (even the new smaller 1 liter Reactor weighs 14.7oz) is eventually offset by needing less fuel (due to increased efficiency) and having a faster boil time, especially when your water all starts as snow. But for shorter routes, even in the winter, having a single unit snapped together is a definite advantage in favor of the Jetboil. There’s nothing better than following a long, taxing winter pitch with the knowledge that your partner (belay you on a guide-style autoblock) has popped out the pre-assembled Jetboil and is brewing up a hot drink with whatever snow or ice was nearby. And rigging the Jetboil into a hangable system is also much easier and more stable than with any competing stove. A 5-minute DIY system that costs almost nothing is to simply put a hose clamp around the cookpot, and tie strings of 3mm cord onto the hose clamp at 3 evenly-spaced points, connecting the other ends of the strings together into a loop a foot above the lid. This creates a “tripod” from which you can clip the system to an anchor on a wall, the peak of a tent, etc. The Jetboil Sol Ti (titanium) system retails for $150 and the normal Sol model, with an aluminum cookpot is $120. Aluminum is a better conductor than titanium, transferring heat into (and then back out of) the cookpot’s contents faster and more evenly than titanium. But every youtube test and ultralight backpacker study I could find showed little real-world difference between boil times using cookpots of these two materials, so I think the difference comes down to an extra $30 for a reduction of 1.2oz. And as any alpinist or backpacker knows, the amount you’re willing to pay for pounds saved is a never-ending question which not even this game changer can answer. This past summer I forgot my Jetboil Sol in a cluster of trees as your break off the main trail towards Prussik Peak. If anyone finds it, should work as good as new. Even has some fuel left in it. One thing to watch out for is weight variance in JetBoil Sol Ti and MSR Reactor stoves. 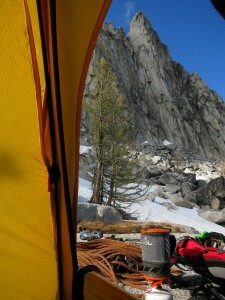 I picked a JetBoil Sol Ti up for the weight savings and convenience on single-day climbs. The JetBoil stove I purchased weighed in at two ounces heavier (all in the pot) than the weight quoted by JetBoil and given by Blake above. At that point, I decided to use a 1L Reactor, which is one ounce less than the quoted weight (for the pot I purchased), half the cost (because I already own a normal Reactor stove), and way more efficient. My JetBoil Sol Ti weighed ~11.5 oz and my Reactor 1L weighs ~13.5 oz. The JetBoil Sol Ti is an awesome piece of kit, just make sure you check the weight of the one you purchase if you are gram counting. I bet there are MSR Reactors that weigh more out there as well.